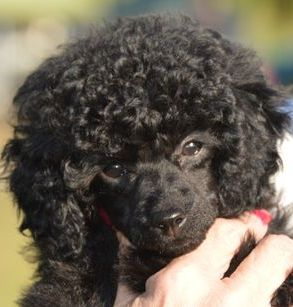 Bayou came to us as a much anticipated addition to our show team and a prospect for our breeding program. 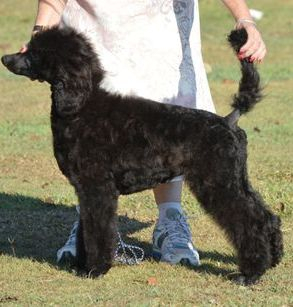 After a false start (read here that I was very inexperienced at show grooming) we managed to title Bayou at age 2 years and one week. there were many group 7 awards achieved along the way including 8 Australian bred of group. Bayou is blessed with a heart of gold and a sense of fun. We had only two litters with Bayou as we are keen to breed away from some of her inherited traits that did not affect her or her puppies, but which limited our choices of sires for her puppies. Some of Bayou's lovely progeny remain here at Blythswood Estate. Trotzen Aurora Designed TShine "Tammy T"
This lovely girl's debut saw her beating all comers for baby puppy of breed on 14 October 2012 at Sarina. Tammy T was silver beige, a colour which clears by aged three. Silver beige is a dilute of brown, in the same way that silver is a dilute of black. 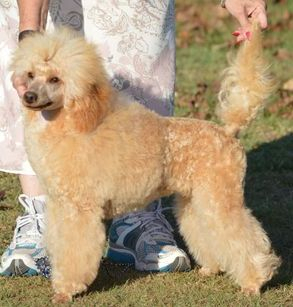 Unfortunately, Tammy had renal disease and had been returned to her breeder. Testing for RD indicated that Tammy had one mutant gene (carrier), but only one is necessary for this insidious disease. My heart is still broken that our time together was so short. Our sweet girl with be fondly remembered. 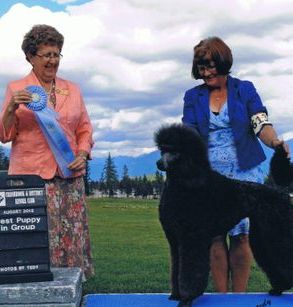 A wonderful natured dog and father of the first Trevasco Standard Poodles. 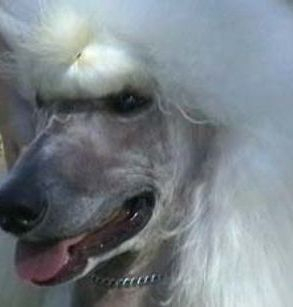 Due to Brynner's amazing coat, and my injuries sustained in an accident in March 2011, I persevered until he had his championship title however I was unable to keep up with the required grooming. A wonderful home was found for Brynner. DM, vWD & NE = Clear. RD = Carrier. 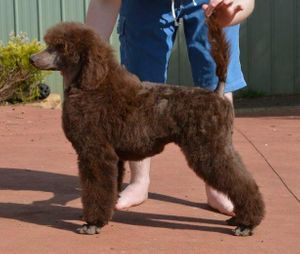 AUST CH SHERTONAH GYPSY GOLD "GYPSY"
Gypsy is the second red standard poodle to attain her Australian Championship title and to date is the only titled red standard in Queensland. Test results DM, NE,vWD - clear. RD - Carrier. Hip Score 6. Colours two genes for light colour, two genes for black (two light genes overrides the black) - no brown, no dilute gene. Gypsy is now retired from the show ring and from parenting responsibilities.